Follow me, if you will, back in time, 21 years back. In 1989 Steve 'Silk' Hurley was only 27, (and just 25 years old at the time of "Jack Your Body"). His Wikipedia page calls him a one-hit wonder, which I think is hilarious, as he produced and remixed shitloads of great tracks over a couple of decades. Even if his busiest period (the nineties) is now behind him, I don't think he's going to get bored any day now. In the late 80s, his "Work It Out" album for Atlantic was an early major label attempt to cash in on the Chicago house sound, and it spawned - or tried to spawn - a couple of singles, notably Chain of Fools with vocalist Charisse Cobb (credited as Risse). However, it would seem that the track didn't really catch on, despite the fact that it very much resembled Hurley's astonishing remix of Roberta Flack, perhaps the finest he's ever done. 12"s of Chain of Fools aren't particularly hard to find, but CDs of it are (it wasn't on Discogs, which is always a good sign, and doesn't seem to have been on any CD compilations). I managed to stumble upon a promo CD almost by accident on eBay, and it wasn't very expensive. 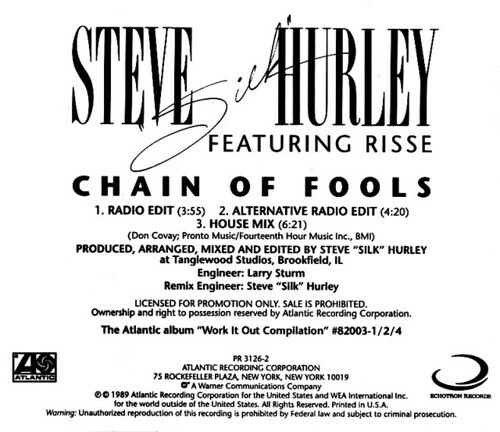 As the back cover shows, Hurley produced, arranged, mixed and edited the track. He probably also taught Risse to sing, built the studio and invented the polio vaccine. I suppose that in those days, if you didn't big yourself up, nobody else would. It's a shame that the CD doesn't contain the House Of Trix mix and Extended mix that are on the 12", but hopefully some people will be pleased to have the track in CD quality at last. You can listen and download below. Enjoy! P.S. I did send a message to Mr. Hurley via Twitter to ask if he had any more info on Risse (can't find anything on the web). I'll add it if he gets back to me. Bonus! Chain of Fools acapella (here), found on the scientician weblog, de-clicked and boosted. This is superb! I love the vocalist on this track. Great production too. I love Charisse Cobb's voice, sounds so great on House Train too and was a huge part of what made Mission Control - Outta Limits a big track. Seems crazy that she only released three tracks (at least that I know of: House Train, Love Baby & Chain of Fools). There's a Charisse Cobb on Facebook who might be the same person but I'm a bit leery of sending a message ("hi, weirdo stalker here, please sing some more! ").